Fans of old time radio delight in the fact that the content they enjoy seems much more refined than the current offerings of network or cable television. This is partly due to the fact that most of the OTR content was produced during a simpler time, but radio faced some critics back then as well. Because commercial radio was a profit-making business, there were any number of critics to point out that radio was a crude form of entertainment that was directed at the lowest common denominator. The network's' biggest competition was each other, of course, because attracting more listeners always meant greater profits. In that spirit, no idea was too good not to steal. This is important to remember when we look at the use of Shakespearean plays on network radio. CBS, long considered the “Tiffany network” for their willingness to spend more money to develop the highest quality programming, announced in 1937 that it would present The Shakespeare Festival during the summer, to begin with a presentation of Hamlet starring Burgess Meredith. Never mind that Shakespeare's plays were meant to be presented by live actors that the audience could see on stage, or that the Bard's work did not adapt well to being cut down to fit an evening time slot, what upset the programming department at NBC the most was the fact that they had not come up with the idea themselves. This seemed to be an easy situation to rectify, NBC would simply present their own Shakespearean plays. The Tiffany network naturally called foul, but since Shakespeare's plays were in the public domain, there was little they could do, even when NBC announced that their Shakespeare plays would air on the same night, even in the same time slot as CBS's. To make matters even worse, NBC planned to begin their series three weeks earlier than the debut of Shakespeare Festival. CBS cried foul, of course, but again since Shakespeare was in the public domain, they could do little but complain. Not only was it NBC’s intention to have Streamlined Shakespeare on the air three weeks earlier than Shakespeare Festival, America’s most prestigious Shakespearean actor, John Barrymore was signed to the project. John Barrymore was the youngest child of the Barrymore acting family, and the one most opposed to the acting trade. His older brother and sister, Lionel and Ethel, went into acting after their mother had died in order to help their theater manager father keep the family business alive. While in college, John studied fine arts, and only gave up his ambitions to become an artist after being fired as a newspaper illustrator. He took up acting as a way to put food on the table and more importantly, to keep himself supplied in booze. Barrymore had enjoyed a very successful run playing Hamlet in London and was very popular in silent films. His theatrically trained voice made him a natural for talkies. However, he had little experience acting before a microphone. 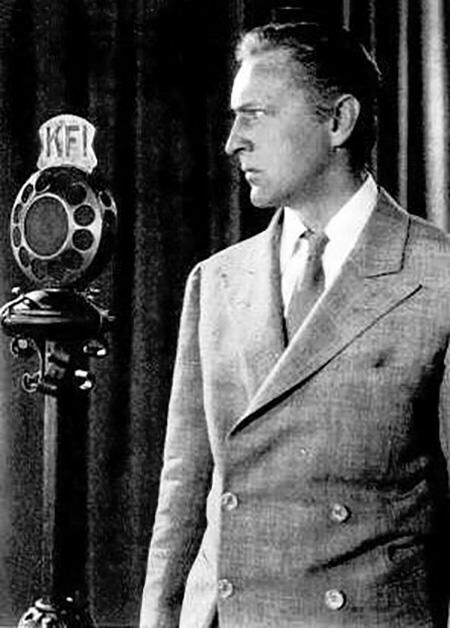 While making the first few broadcasts of the Streamlined Shakespeare series, he annoyed the engineers by standing as close as he could to the mic and booming out his lines in a full stage voice. Finally, the crew built a fence around the microphone stand so that he could not stand on top of the mic. Neither Shakespeare Festival or Streamlined Shakespeare caught on particularly well with the listening public, and listeners were probably relieved when the programs they were replacing came back from their summer break. Streamlined Shakespeare was rebroadcast during the 1950s in association with NBC University of the Air and over AFRTS. Be the first to comment on "Streamlined Shakespeare"